The original Hotel Costes fragrance, once called Costes but now presumably Costes No. 1 to distinguish it from their newer eponymous scent, was something of a cult favorite, although I don't hear about it so often these days — is anyone out there still wearing it? At any rate, it was done by perfumer Olivia Giacobetti and was based on the hotel's signature room fragrance.1 Giacobetti also did their new fragrance, Costes No. 2, which was reportedly "inspired by the Hotel's signature rose bouquets and the recently opened rose florist shop"2 (the notes: benzoin, cinnamon, Turkish rose, geranium, orange blossom, and gaiac wood). If you're after a boatload of roses, though, be warned that you won't find it here. Costes No. 2 is, first of all, a very quiet scent: my advice to anyone trying it from a sample vial is to apply as lavishly as you can — this is probably a fragrance that is better sprayed than dabbed. The opening is spicy and lively, with lots of cinnamon, but it softens rapidly, and from there on in, it's one of Giacobetti's paler, airier fragrances.3 It's clean and smooth, and smells like a lightly decorated clean musk as much as anything. There is orange blossom, and a whisper of rose, and the benzoin is pronounced in the earlier stages. There's just enough wood to keep it from floating away altogether. If you're looking for a clean, crowd-friendly fragrance for summer, something that will stay close to the skin and not overwhelm on the hottest days, Costes No. 2 might be perfect, and if you're willing to accept that the soft aroma left on skin after 20 minutes is all you're going to get, then you could also say that the lasting power is excellent. For my part, I like ethereal fragrances and Giacobetti makes some of my favorites, but there just isn't enough going on here to capture my interest. Hotel Costes No. 2 is available in 100 ml Eau de Toilette, $135. 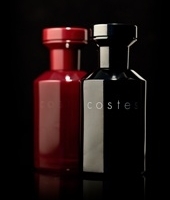 For buying information, see the listing for Hotel Costes under Perfume Houses. 1. The Costes room spray was spicier and less soapy than the personal fragrance, and I liked it best of the two, although I haven't smelled either in quite some time. 3. I found it to have considerably less "presence" than Giacobetti's Eau Egyptienne for Cinq Mondes or L'Été en Douce for L'Artisan, if that helps anyone. Thank you for reviewing this! I’m so pleased because I’ve been toiling with purchasing a decant, blindly. You’ve helped me make up my mind. I don’t think this is really me. Thanks for saving me the $$! I liked it much more than the first Costes. In fact, it really grew on me – it becomes a kind of general fuzzy warmth on my skin. I get a lot of orange blossom and wood. A ‘general fuzzy warmth’ is a good way to describe it. Did you love it enough to buy? Hmm, you know, I think maybe I do. But I don’t think it’s in the UK yet. Will check Harvey Nicks out on my next visit. After our 10-spritz commentversation the other day, I should add that anything so light that it’s almost not there is most definitely rarely up my alley, especially for $135. Seems like one could bust out Giacobetti’s Drôle de Rose (probably available inexpensively at auction) and save themselves some trouble? Joe, this is WAY less rose-ish than Drole de Rose, & probably more orange blossom than rose anyway. And definitely a 10 spritzer for me. I love the original Costes and reach for it a lot in the winter; I get peppery, cinnamon-y incense and luckily no soap. I tried the new one and my experience was like yours–dabbed from a sample vial I could hardly smell it. I’ll try it again if I’m ever near a tester I can spray… SOTD is another Olivia Giacobetti…the yummy Idole…! Idole is lovely. Wore Penhaligon’s Elixir again this week, and that’s lovely too. I really do love Olivia Giacobetti’s scents, even the very ethereal things like the L’Artisan’s The Pour Un Ete. This is just not interesting enough to me. Thanks for the reminder! I still need to try Elixir…keep forgetting. I love tons of things she’s done for L’Artisan — the ST, also the Fou d’Absinthe, Dzing, L’Eau de L’Artisan, among others. She’s really a wonderful perfumer & I was quite sure I’d love this one — but no. This is just about the same review I would have written. I like quiet scents too and this one is definitely that. It struck me as a Prada Infusion type – that same ethereal fresh thing going on. I like it much better than the Prada Infusion d’Fleur d’Oranger though. I would like to get more of the base notes from Costes 2 – I mostly smell the “ethereal orange blossom.” It would definitely make a pleasant warm weather scent and I do like it better than the original Costes, but I’ll see what I think after I finish my sample…not sure if I find it interesting enough either. I like it better than the Prada orange blossom too, but then, I pretty much hated that. I do think Prada Infusion d’Iris, light as it is, makes more of a statement than this. Agreed. Adding, I wanted to love this as it’s so hard for me to find quiet, ethereal (but lasting) scents… and I like the bottle. For now, though, it’s like, not love. I *adore* the bottle. And it would look really cool to have both scents in the bakelite — the black & the red. Pansy- have you tried Prada L’eau Ambree? it is light , very pleasing in a comforting, just nice smelling way and lasted for hours on me. I’m afraid the Costes 2 sounds a little boring to me too. Of course just being OG’s makes it worth sniffing but my expectations aren’t very high. :::: Raises hand high ::::: I still love, and wear the original Costes. Big fan of Olivia Giacobetti’s work but, sadly, Costes 2 did not knock my socks off. I don’t hate it, but it’s nothing that screams ‘Buy Me! Buy Me!’ either. Hey M! Glad someone has chimed in. I wouldn’t say I hated #2 either — just not interested. The “look” of the bottle is very at-odds with your description IMO. The bottle is so heavy and bold looking for a fragrance that is apparently light and ethereal. I don’t think it is for me, but I am wondering . . . at what point did luxe hotels begin producing their own fragrances? Is this a new phenomenon or is it something that has been around for a while? Thank you (as always) for the lovely review. They’re certainly not the only hotel making their own fragrance for use as room spray…but offhand can’t think of that many others selling personal fragrances. The Ritz in Paris sells men’s & women’s scents (Aedes has them), and I’m sure there are others I’m not thinking of. Le Sireneuse has a gorgeous line of perfumes (L’eau d’Italie). In fact, they’re so good it’s very easy to forget they started out that way.